Many users are not aware they can try different Galaxy Note 9 S Pen nibs to get different experiences from the S Pen. The spare S Pen nibs and the tool are often neglected by Galaxy Note device owners. It is a waste for many users who feel the S Pen is too sticky or too slippery. This S Pen guide explains the different usages of the spare Galaxy Note 9 S Pen nibs and how to change the nib for Galaxy Note 9 S Pen. Galaxy Note 9 introduced many new features and updated S Pen with Bluetooth support. 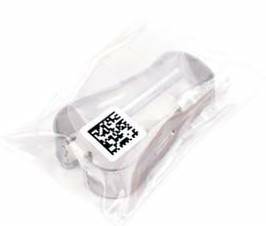 In your Galaxy Note 9 box, you may notice the following small plastic bag. Some users may think it is a weird connector for some ancient devices and throw it away. Do NOT throw it away. You will need the items inside it when you want to change the Galaxy Note 9 S Pen nib. Tweezers. This is provided as a tool for S Pen nib removal. Another tiny plastic bag with two (2) pieces of spare Galaxy Note 9 S Pen nib (tip). Prior to Galaxy Note 9, there are 5 pieces of spare S Pen nib. It seems Samsung is less generous on accessories for the more expensive Galaxy Note 9. When and why you need to change Galaxy Note 9 S Pen nib? When you use the S Pen on Galaxy Note 9 screen, some users may feel it is too sticky. Some may feel it is too slippery. Even for the same phone, after you apply a screen protector, you may find it is a bit harder to use the S Pen. In these cases, you may change the S Pen nib to see whether the performance of the S Pen is better. Besides, if you are a heavy user of S Pen (e.g., frequently using the S Pen for design or note-taking), the S Pen nib may experience severe wear and tear. You may have to replace the S Pen nib every one or two years. Of course, if you seldom use the S Pen, then this guide is not for you. Which Galaxy Note 9 S Pen nib to use? The two spare Galaxy Note 9 S Pen nibs are coloured differently depending on your phone colour, your region, and the manufacturing batch. One of the spare nibs is darker (close to black or grey). The other one is lighter (close to white). In this guide, I will simply use black and white to represent them, although the actual colours are not. The black one is usually softer. So, it offers large resistance and better grip on Galaxy Note 9 screen. The white one is usually harder. So, you can expect it is easy to move it smoothly on the screen. In short, black=soft, and white=hard. The S Pen, in most regions, is pre-fitted with a black nib. In other regions, it is fitted with a white one. It seems Samsung is not sure which one is better for you. If you are happy with the current S Pen, don’t change. If you feel the S Pen is a bit slippery on the screen, you may change it to the black one. If the current one is black, then you have no choices. If you feel the S Pen is a bit sticky on Galaxy Note 9 screen, you may change the nib to the white one. If the current one is white, then you have no choices. If you are using a plastic screen protector, you may have to use the black nib. The harder nib (white one) may damage the plastic screen protector. If you are using a tempered glass protector, usually you will find the white nib works better. Never use third-party or OEM nibs for Galaxy Note 9. To change the nib for Galaxy Note 9 nib, you may follow the animations below. First, firmly hold the nib with the tweezers and remove it as shown below. Once the old nib is removed, you can insert a new one as shown above. You should not press the nib excessively when inserting the nib to the S Pen. Is Galaxy Note 9 S Pen nib interchangeable with other Galaxy Note S Pen nibs? Since Galaxy Note 7, the S Pen nib has been smaller (0.7mm vs 1.6mm in Note 5 and older Note devices). Also, the pressure sensitivity of the S Pen has increased t0 4096 levels (from 2048 levels in Galaxy Note 5 S Pen). So, you should NOT use S Pen nibs for Galaxy Note 5 or older Galaxy Note devices on Galaxy Note 9. You should also avoid any third-party S Pen nibs for Galaxy Note 9. Do you know which Galaxy Note 9 S Pen nib is for you? Can you change Galaxy Note 9 S pen nib now? If you have any questions on Galaxy Note 9 S Pen nib for Galaxy Note 9, please let us know in the comment box below. The community will help you find the answer. For other Galaxy Note 9 guides, please check this page. To download or read the official user guide for Galaxy Note 9 in your local language, please check this page.